0 products in your cart, total money $0.00. Purchase over $100 Free shipping, Except Express Post. This LED Hard Strip Light also has a UV Resistant function to ensure that your outdoor applications in areas where there are high ultraviolet rays such as Australia. Its high waterproof rating design makes it possible to work in all weather conditions, such as raining weather. It is also power efficient and comes in cool white, blue and red for your selection. 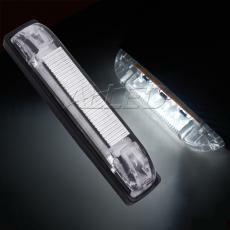 It is suitable for interior or exterior automotive, marine, caravan, motor home and camper trailer lighting. It also provides optimal illumination for exterior courtesy, stairway lighting and boat under gunwales lighting. Have you ever attempted to locate the LED hard strip lights around the interior board or just make it as a deck light for surfing through the water? Due to the super brightness, it is always the hit to trap you in the green eyes. Its overwhelming super brightness pours out through the delicate and durable UV cover, which is not only of attractive look as Christmas light also more than durable for the harsh environment at sea. Super waterproof capacity never compromise to the excessive humid environment, all brilliant designs(completed sealed circuit board & watertight rubber gasket)will 100% guarantee a dose of salt water away, even the boat are in mess after the fierce water flooding ,leave alone the hard strip light, it is much better to worry about your wet shirts instead. Excellent indirect lighting output promises your easy night fishing with great illumination, the board lighting angle and gentle illumination without eyestrain play as the considerate protective measurements, only for caring about your eyes and kidding out the colorblind accident for letting off a sharp. The clean finish idea is tailored specifically for the prim amateurs, such as specific hidden line groove, the removable side clip for concealing the mounting screw, which are all chasing the more convenience and more pleasures to eyes. Easy installations, as the fixture course is so simple that you can DIY it with only one scan on the manual. Just locate the installation you want, ensure the positive and negative wiring then connect them all. This light series is designed for boat applications. © 2005-2019 ALLED Copyright, All Rights Reserved.